Brainsway’s Deep TMS system features the revolutionary H1-coil, developed and patented at the National Institutes of Health (NIH). All other TMS devices cleared by the FDA for major depression treatment use a version of the standard figure-8 coil. 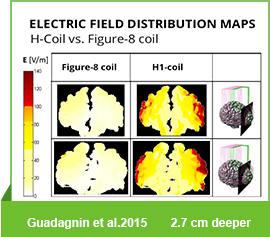 The H1-coil delivers TMS to deeper and broader prefrontal brain regions, using the same safe stimulation levels as figure-8 coils. Deep TMS is well tolerated, with a dropout rate of just 8% in a multicenter trial (Levkovitz et al. 2015). The deeper and broader field produced by the H1-coil stimulates a larger volume of cortical gray matter in prefrontal depression targets. 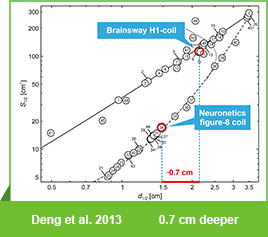 The depth penetration advantage of the H1-coil has been confirmed by different published studies using different measurement methods (Click on the “Delve Into the Science” button below , and see Section 2). Figure-8 coils produce highly focal stimulation that may miss depression targets in the PFC more than 30% of the time (George et al., Arch Gen Psychiatry 2010;67:507-516; Herwig U, et al. Biol Psychiatry 2001;50:58-61). 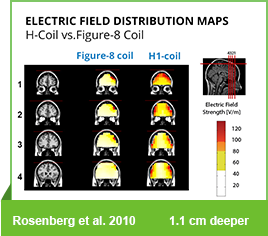 The H1-coil activates the relevant target in the PFC every time (Click on the “Delve Into the Science” button below, and see Section 4). The clinical results speak for themselves.In a large, multicenter randomized trial, 1 in 3 medication resistant patients treated with Deep TMS achieved remission (Click on the “Delve Into the Science” button, and see Section 5). 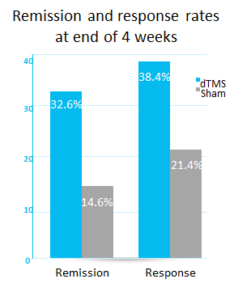 Brainsway Deep TMS is FDA-cleared for treating depression with shorter sessions and fewer pulses than any other TMS device. This saves time for providers and patients. For more in-depth information read the white paper. CLICK HERE TO DELVE INTO THE SCIENCE!